Rose Damerel, daughter of the Rector, is quietly in love with a poor naval lieutenant Edward Wodehouse who loves her but has not yet declared himself - and who will soon be away at sea for three years. 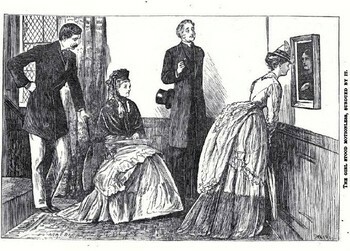 Mr Incledon the wealthy squire of Whitton Park is also attracted to her, and Rose's parents look favourably upon him. However before anything proceeds further, the Rector dies suddenly, leaving his family impoverished. Now Rose is subjected to extreme pressure to engage herself to Mr Incledon. This novel takes place at Dinglefield Green, and is part of the Neighbours on the Green series (see link below). However the story stands alone, and is not dependent upon the other stories in the series.